Lebron is coming. Someone showed him an apartment in the Time Warner Center. Someone else showed him a townhouse in the Village. Our sportswriters are sure he will, sure he won’t — filled with New Yorkers’ characteristic mixture of self-aggrandizement and self-doubt. In unsolicited tough-love letters, they have whispered what is wrong with coming to the Knicks (the Bulls are better; Miami and D-Wade!, the Russian!). But I believe if he leaves Cleveland, he will come to the Knicks, because unlike in those other cities, he’ll be the one, the beginning, the icon who captures the city. If he comes, it will be because he has a dream of New York like the rest of us. A dream in a city of dreamers. Who dreams of Miami? People retire to Miami. Who dreams of Chicago? People lost in the Midwest. Gangsters. Nobody, but nobody dreams of the Nets. If he takes over New York and if he wins, and there really is no reason he shouldn’t, then he will have his own legend — he won’t be the first but he could conceivably be the longest lasting. He’ll be able to do it differently, on his own terms, with a dash of D’Antoni to make it exciting. Lebron is not coming, and the city is sweating, not just from him but from the heat. It’s so hot for June that an automated (presumably electronic) call from Con Edison comes asking that we turn of any inessential electronic devices such as computers, or televisions. I leave on the WII so my 15-year-old daughter can continue trying to finish Super Mario Galaxy 2 before she goes away to camp. This is an essential device. Lebron is not coming and seems likely to join the chorus of suburban New York haters, the ones who never left home, who are afraid of leaving and worst of all the ones who left here to go back: We are crazy to live here, they say, right up against each other all the time, thisclose, as our tabloids say. Yes, we know about proximity. Maybe Lebron doesn’t want this. Fifth Avenue crowds, Times Square traffic. the subway. He seems to be interested in crowds as long as they’re cheering for him, but if he comes, he should know that the trick is to discover Fifth Avenue when it’s empty, on a suddenly cool day, or Think Coffee when it clears out due to the air conditioning breaking down and you can get the best seat: a vantage point from which to observe the woman in her paper thin sundress cross the path of the middle-aged Asian matron dressed in heavy pants and a t-shirt but carrying a blue umbrella to protect against the sun. Or slip unnoticed (or unremarked) into a free jazz concert in Central Park featuring McCoy Tyner pulling signature sound out of the heat. The way James Spader and Sir Laurence Fishburne (or their doubles) did last week. Sometimes we live in our city as if we were the only ones here. But not always. In New York, proximity means empathy or at least appreciation or tolerance or walking quickly. Not just for the famous and proficient, the Yankee or the jazz icon playing a free concert in the heat, but even for the man who styles himself The New York Times Published Poet offering verses for money from a perch along a cavernous subway transverse. We appreciate devotion, we disregard hypocrisy; we’re able to look the other way when we see a celebrity and when we see a hopeful: an actress building a career who is meanwhile a very proficient waitress or a novelist daylighting as a company pitchman. Lebron has been house hunting. Looking at houses we dream of buying. He will enter the city already admitted to its inner sancta; which most of us read about but will never enter. That’s his right. As long as he commits to going out, incognito, or cognito, to the local bodega, or developing a favorite low key restaurant, or walking through the park, on a cool Thursday — taking advantage of the fact that this city is big enough to dwarf even its most famous residents, which is what keeps the rest of us believing in its boundaries, finish lines, measuring sticks. He’s looked at an apartment in the Time Warner Center with lavish views and one of those gorgeous brownstones on Perry St. that seem wonderfully accessible yet secretly house movie stars. In the village, everyone walks. He can slip into Barbuto of a Monday and have the perfect roast chicken and a fancy glass of Rosé. Positioned right, he can bring his dog if he’s got one and the dog, if well behaved, will blend in too. I would prefer he live in the Village, but will understand it if the Time Warner Center comes out on top. It’s a vertical mall — a mall in the city, which holds a hometown appeal for those of us who came here from suburbs. If he lives there, there will be room for all of his advisors, including the ones who seem hell bent on telling him not to come. He can send his chef to shop in the basement at Whole Foods. He can buy one of those bulbous sculptures and move it upstairs to his living room. But I hope he rides the Jazz Elevator on an odd Tuesday to Dizzy’s Club Coca Cola and takes the table in the front with his girfriend to see Eliane Elias. As the Brazilian-inflected jazz heats up, so does the sunset, reflected off the mirrored midtown office buildings onto Central Park. I recommend the martini, the ribs and the Peach Cobbler. We’re impatient and good at waiting and demanding and nosy and belligerent and understanding and conflicted and overwrought. What will become of us, if island that we are, we get ignored out here — and no one comes and no one thinks we’re important or even interesting? No matter, we will say, eventually. We spurned you first. We are a city of spurners after all. Having left somewhere else, we’re fiercely committed to being here. (Sure we’re always wondering if they remember us back home, in Cleveland. In Akron, in Jersey, in Chicago, in Miami.) 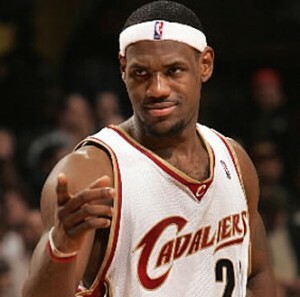 So come Lebron, come. But remember, in order to make it here, you have to move here first. 4 comments to Lebronx is Up? I can’t believe Lebron is releasing his own cartoon show. Good grief.